Coming out of Sundance earlier this year there was a lot of talk surrounding director Craig Zobel's (Compliance) Z for Zachariah and it's rather stellar cast. Looking on IMDB confirms what the trailer hints at in that the three leading characters are the only ones in the film and as the trailer indicates Margot Robbie, Chris Pine and Chiwetel Ejiofor seem to be giving some profound performances as they each navigate their way though a fertile valley that has somehow been spared from nuclear war. While the focus of the trailer is clearly outlining some kind of love triangle tension between the three characters it is clear that Zobel, working from a script by Nissar Modi from a book by Robert C. O'Brien, is playing with a wider range of emotions and implications with this post-apocalyptic story. It is unclear what exactly these emotions and tensions as a result of such feelings will lead to, but given the heightened state of distrust and worry the atmosphere automatically suggests it isn't difficult to see that things will lead to some intimate and unexpected places. I enjoy the work of each of these actors as well as appreciate Compliance despite its stressful and irritating story and this trailer certainly has me interested in what Zobel has decided to try next. I certainly hope that I will be granted the opportunity to see this on the big screen despite the horribly photoshopped poster suggesting it something akin to a direct-to-DVD feature you could find at any Redbox. Here's to hoping Z for Zachariah's scheduled release of August 20th ends up being a wide release and not a limited theatrical with VOD option. Hit the jump to check out the trailer and the aforementioned horrible poster. Synopsis: In the wake of a nuclear war, a young woman survives on her own, fearing she may actually be the proverbial last woman on earth, until she discovers the most astonishing sight of her life: another human being. A distraught scientist, he’s nearly been driven mad by radiation exposure and his desperate search for others. A fragile, imperative strand of trust connects them. But when a stranger enters the valley, their precarious bond begins to unravel. 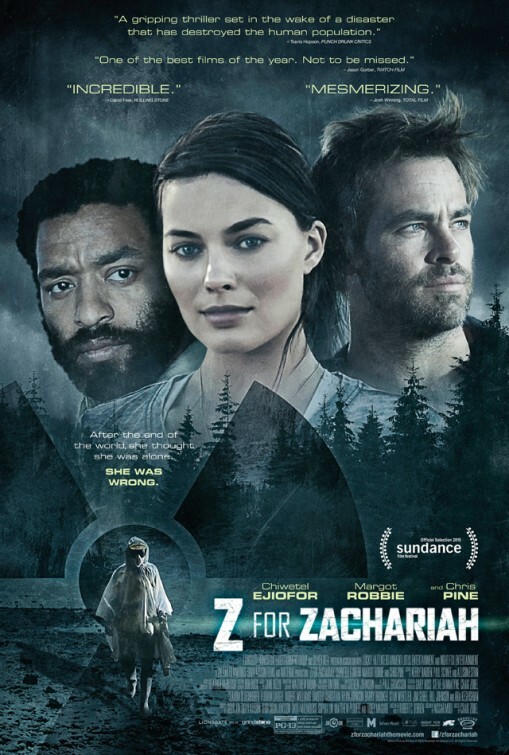 Z FOR ZACHARIAH is inspired by the novel of the same name by Robert C. O’Brien, published posthumously in 1974, and was created by Pall Grimsson and adapted for the screen by Nissar Modi (Breaking At The Edge).